Kisses is a neat desk accessory designed by Hershey Kiss and being sold by Hidden Art Shop. 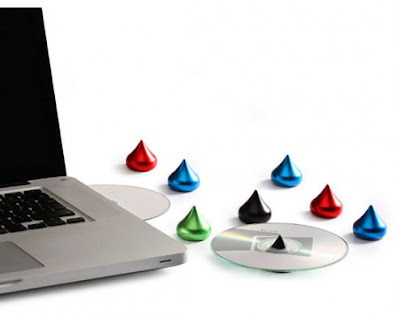 These colorful Kisses will help to hold your CDs into a manageable stack. They are made from aluminum and bite off. Even-though this is an artistic and beautiful design, but it does not necessary a good CDs holder since this kind of open holder will be vunerable to dust or uninttended drops. These Kisses comes in Black, Red, Green or Blue color options.